Yesterday, South Carolina reached a major milestone in advancing potential offshore wind energy development in years to come. The Bureau of Ocean Energy Management (BOEM), the federal regulator that oversees offshore wind development, announced plans to publish two major documents that close in on eventual offshore wind leasing. The two documents are a Notice of Intent to Prepare an Environmental Assessment (EA) and a Call for Information and Nominations (“call”) on certain areas preliminarily identified as potentially good areas to develop offshore wind energy. These documents are scheduled to be published in the Federal Register tomorrow, and will show four areas identified for potential wind development, totaling 1,167 square nautical miles. The identification of the “call areas” has been years in the making, largely informed by South Carolina stakeholder meetings of local, state, and federal agencies and groups. These meetings have been going since at least 2010 under the direction of the State of South Carolina and since 2012 under the direction of BOEM. Through this process, the groups representing broad interests from local town officials and chambers of commerce to the Department of Defense and U.S. Fish and Wildlife Service, sought to identify the areas that balanced high suitability for wind development and potentially conflicting uses, such as artificial reefs, areas of high boat traffic, military activity, and areas of high bird activity like Cape Romain National Wildlife Refuge and around Winyah Bay. The “call” asks potential developers to submit an indication of whether they are interested in developing a portion of the call areas, and if so, which specific areas. This process helps determine where the most suitable development areas might be and also determines if the eventual leasing will be a noncompetitive or competitive lease sale. The call additionally kicks off a 60-day comment period, starting tomorrow (Nov. 25th), in which the public can chime in to help inform the best possible process for siting wind leases. BOEM is seeking public input on identifying the environmental issues and alternatives to be considered in the EA, including geological, geophysical, and biological conditions in the call areas; known archaeological and/or cultural resource sites on the seabed within the call areas; historic properties potentially affected; other uses of the call areas; and other relevant socioeconomic, biological, and environmental information. BOEM is particularly interested in receiving information on historic sites, districts, and National Historic Landmarks, as well as cultural corridors and other historic properties, whose viewsheds may be a contributing element to eligibility to the National Register of Historic Places. Instructions on how to submit comments is on BOEM’s South Carolina webpage here. 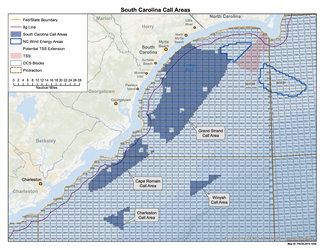 The identification of South Carolina’s call areas is a large step forward for offshore wind in the United States. The 1,167 square nautical miles within the call areas more than doubles the potentially leaseable offshore wind area in the United States. Furthermore, as the state with the second greatest developable offshore wind resource, South Carolina stands to benefit greatly from future development of offshore wind farms. The first offshore wind farm in the United States began construction this year, and there are 18 more projects proposed around the country, most of which are in initial stages. The cost of offshore wind energy remains a significant issue, however, as we have pointed out in previous analysis, offshore wind energy in the Southeast is also a very high-value power, with the ability to offset more expensive summer peaking generation. Additionally, Clemson research has shown that offshore wind poses a great potential source of economic development for South Carolina, which is why communities such as North Myrtle Beach, Charleston, North Charleston, and even the South Carolina Legislature have embraced the opportunity presented by offshore wind. Add in the significant environmental benefits of offshore wind, especially in light of the new carbon regulations from power plants, and offshore wind may prove to be an extremely valuable asset for our state. BOEM's flowchart for the offshore wind permitting and review process. While the call is a big step forward, it is just one of many steps that must be taken before any leases are issued or any wind turbines can be constructed. After the call is issued tomorrow, there will be a 60-day comment period, then months of work for BOEM, incorporating public feedback while continuing stakeholder outreach and conducting environmental reviews. Next, BOEM will issue an area identification, which will further narrow in on which areas may be able to be leased, followed by the publication of a draft Environmental Assessment. The draft EA will have a comment period followed by months of BOEM incorporating public comments and revising the EA accordingly before they issue a final EA. If the EA finds no significant impact, only then, can a lease sale be scheduled. If a developer claims a lease, they still are not allowed to begin construction until an entirely separate permitting and environmental review process takes place. It is expected that the developer will take a few years to take site assessments and gather onsite data before submitting a Construction and Operations Plan, which lays out the proposed construction plan and triggers another environmental review. All told, we are still many months and multiple comment periods away from any lease issuance and years away from any potential construction. While we are still many months away from reaping the benefit of offshore wind in South Carolina, given the huge wind resource we have, along with its great economic and environmental benefits, SACE welcomes this development that is critical to realizing the potential of offshore wind. We are eager to continue working alongside local, state, and federal groups to help site offshore wind farms in the most responsible and economic areas.